Social Justice? Or Something Higher? McNaughton never guessed that his image "One Nation Under God" would exert such a polarizing effect on both the public and the media. Shortly after I posted my article on McNaughton on this site, a reader pointed me to an article that derided the artist for taking his stance that the U.S. Constitution was founded upon Christian principles. (For my article, “Keeper of the Flame,” click here.) I’m not going to name the writer of the critical article, because I see no reason to involve names if I am merely going to take exception to someone’s opinion. I won’t insert a link to the article, either, for the same reason, though if someone wanted to find it badly enough, I imagine they could do so. Below I will share enough of the article (his article, not mine) to get across the gist of it. My point here is not to quibble with an individual, but with a mindset—and the mindset is truly out there. That was my point in writing the story I wrote—to call attention to how radically our society has shifted in recent years. If McNaughton is any kind of political ideologue, then his ideologies are such as would hardly have raised an eyebrow decades ago. When what were once commonplace sentiments are suddenly to be construed as radical misguidedness, it’s time we all took notice. But the writer was really not much concerned about McNaughton, per se. As I soon noticed, his real targets were Glenn Beck and an author, now deceased, named Cleon Skousen. Those, certainly, and maybe anyone who might think as those thinkers do. While the writer does not connect McNaughton with Beck, he suggests that McNaughton’s politics are in line with those of the “obsessed” and “anxious” elements of the American Right—this, presumably, being Beck’s America. As he wrote, “A large number of Utahns [McNaughton is a Utahn, as is his critic] have been watching Glenn Beck, and taking him very seriously indeed. And the movement he leads and inspires seems to be growing. Call them tea partiers or 9/12ers or Palinistas, there’s a widespread anxiety on the Right that’s finding a voice. And the ideas aren’t just those of Beck. 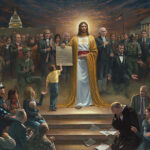 In addition to Satanic Supreme Court decisions, Darwin, and the Constitution, one other publication is prominently featured in the McNaughton painting. On Jesus’s right hand, in the Good People group, an African-American college student holds a copy of Cleon Skousen’s The Five Thousand Year Leap. Is that last statement really justified? Can we deduce anyone’s intent—an intent to found a movement—simply from their ideologies and opinions? That seems a stretch. Now, I will not dispute the idea that there are many Americans who feel just as that writer does. Especially today. But what I sense gets lost in this whole conversation is the idea, as I truly thought McNaughton conveyed it, that the U.S. Constitution was founded on Christian principles. I don’t think McNaughton construed it as direct revelation from the Father or the Son. In fact, I know that he expressly denied that. I would challenge anyone who asserts that McNaughton regards the “divine” element in the Constitution as anything other than influence—the influence of the Bible (itself a divinely inspired document, of course) on the minds of men and women. Moreover, I get the opinion, from reading McNaughton’s critic, that this writer does not view America as a singularly, or even a particularly, Christian nation. America is the most Christian nation that has ever existed. No country has shown more steadfast devoutness, nor lavished so much charity on the world’s needy, nor advocated more strongly or more broadly for the Bible and for the faith, nor given more credit to the Almighty. Nor, correspondingly, has any nation in history ever been so graciously and abundantly blessed – not just in material wealth, but in industrial might, and inventiveness, and scientific achievement, and a raft of other ways. As I have written elsewhere, we are faced with a question that demands the sincerest consideration. Two superlative conditions apply to one nation. Is this to be dismissed as a mere accident? Is the fact that the most Christian nation in history also happens to be history’s most prosperous, progressive, creative, enterprising, industrious, and accomplished – is it coincidence? No, it is the effect of a cause, and that cause is the nation’s Christian grounding. Reader, give your eye to those values as cited above, and ask yourself if there is anything eternal in any of them. Yes, they are virtuous acts. Yes, even the Bible urges us to feed the hungry, care for the poor, and to show forbearance to others. These are good things. They are moral. But the Bible is not exclusively about arriving at secular, social, earthbound results. It is about gaining eternity with God. It admits, reminds, even cautions that earthly, secular life might never be happy—not for us, not for our friends, maybe not for our society, maybe not for entire nations, or even for the nation that the Bible’s reader happens to inhabit. We were made—everyone was made—for better things than this purely biological, transitory, fleeting life. The writer cites commitments to “ending poverty,” “caring for the poor,” “to tolerance, diversity, and social justice.” Anyone could advocate for any or all of these causes and yet that person could be someone who has nothing to do with Christianity or the Bible. The Bible’s values often coincide with secular values. But the Bible does not hold a monopoly on secular values, and it clearly makes them secondary to concerns of eternity. So which is it to be? Weren’t we trying to establish whether or not McNaughton’s thesis is right—that the Constitution has Christian underpinnings? Is the artist to be faulted for not conceiving of an America that was his critic’s America—one that could easily be confused with any merely well-intentioned nation in history, even a heathen nation? 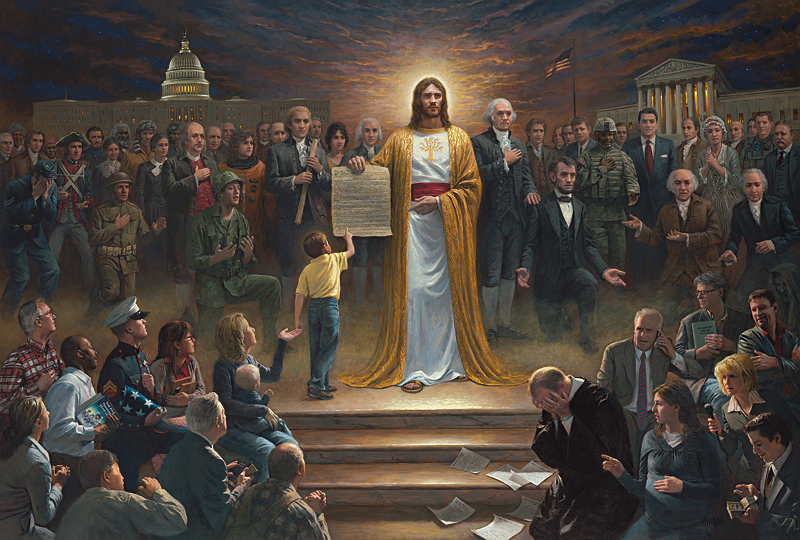 If McNaughton’s artwork is not about social justice, it can still be about Christianity, and it can still be about America. When critics allege that McNaughton is not a defender of merely secular virtues, they have not met McNaughton’s arguments—they have simply dodged them. The work of Christ was about achieving eternal life. This idea, disquieting as it is to many people, is the real message of the Bible. Finding comfort in this world, finding “health and wealth,” finding happiness in the here and now, even enjoying a Utopia on earth—these prospects are not inherently repugnant to God, and God probably would wish that each of them could be enjoyed by His creatures at every minute. But if earthly blessings can hinder us in our chances at greater happiness, God would not wish these things for us. Better to confront us with discomforts than let us miss out on higher prospects. This is not the place to argue such questions—I only throw out some reminders that what separates Christianity from human ethics is the eternal. If what we do is not in service to the eternal, then it is at best spiritually neutral, and at worst a hindrance to our souls. We all want good things, and happiness, and quality of life. We want freedom from oppression and from want. I want these things. I want them for myself. For my loved ones. For my fellow man. But I would hope that I hold a greater desire for that “city with foundations,” and again, not just for me but for my fellow man. I believe that our nation was founded on higher ideals than societal or Utopian ideals. I believe our nation was founded on Christian principles, not so that we would have a prosperous nation, not so that we would have justice, or civil liberties, or any such serendipitous byproducts of being a Christian nation. I believe our nation was founded on Christian principles because our founders were largely Christian and accordingly were motivated to shape a society that would bring glory to God, irrespective of what God might do for man this side of Glory. And yet it is because such men put God’s guidance above earthly rewards, that God indeed blessed America in ways that included even earthly rewards. That’s how God works. I believe McNaughton was right, is right. Ours is One Nation Under God. That venerable statement belongs—because our founders sought to make it so. IF YOU WOULD LIKE TO RECEIVE MY FREE CHRISTIAN E-NEWSLETTER (circulated bimonthly), just send me an email at jesse.mullins at juno.com. Thanks!! FOR MY ESSAY “One Nation Under God: What Does the Statement Mean?” (posted 5/29/2010) go here.